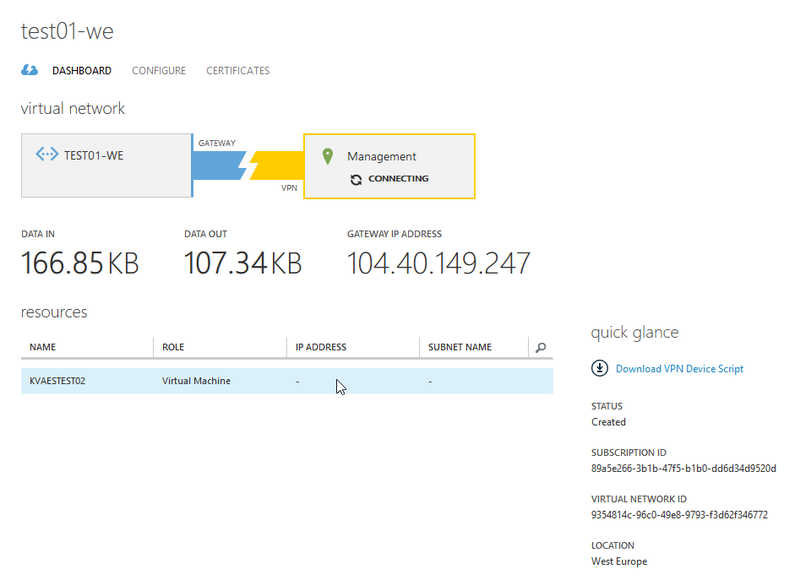 We’ll be setting up an IPSec VPN tunnel between Microsoft Azure and a development/management environment using commodity internet connection of a Belgian ISP. 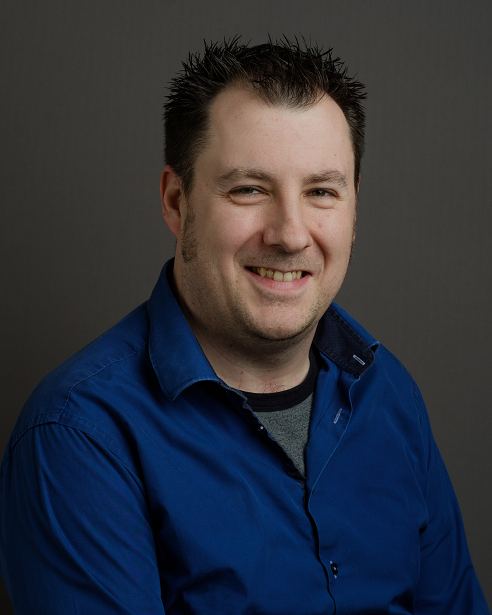 What will our test environment look like? The steps we’ll be going through? 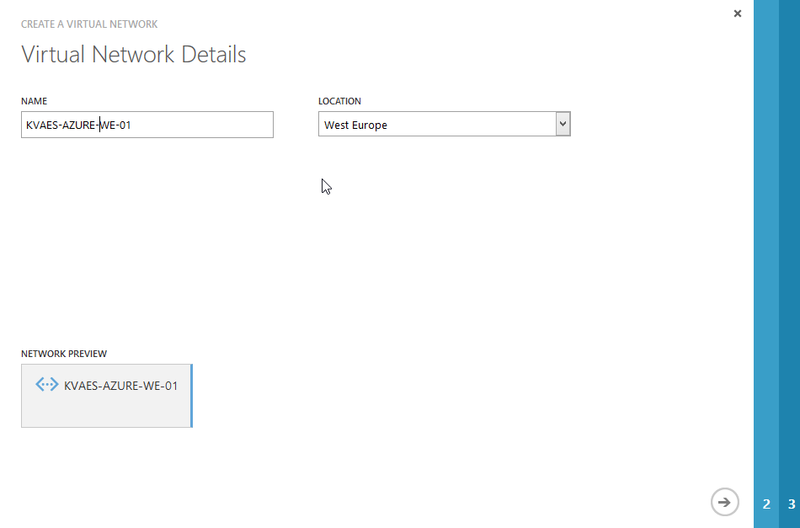 Enter the name for your virtual network and choose your region. 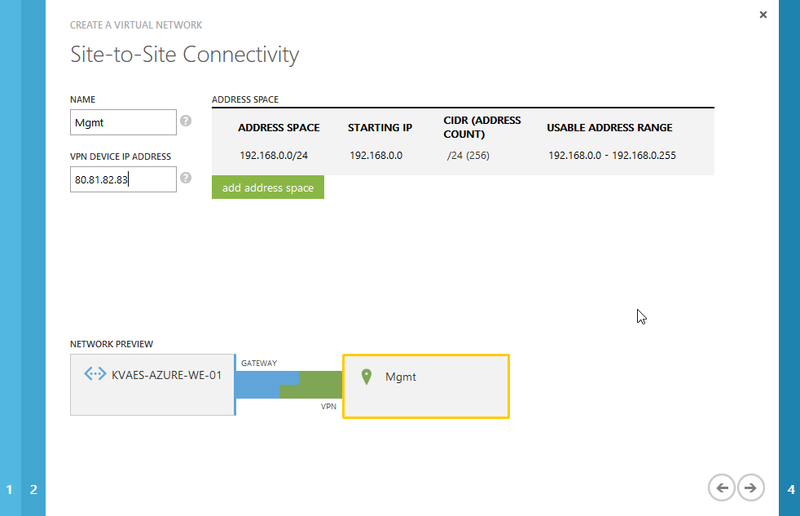 We’ll be using the DNS servers of Azure for this test. 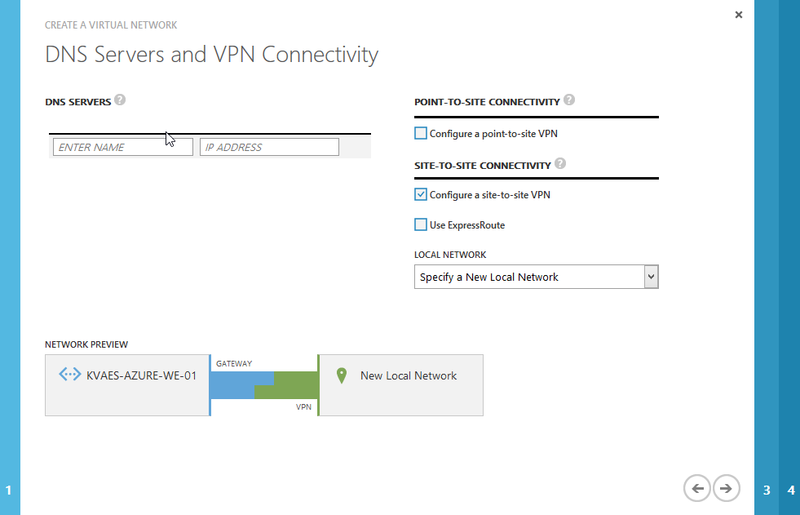 So just select “Configure a site-to-site VPN” and “Specify a New Local network”. Now we’ll be defining a new “local” network. 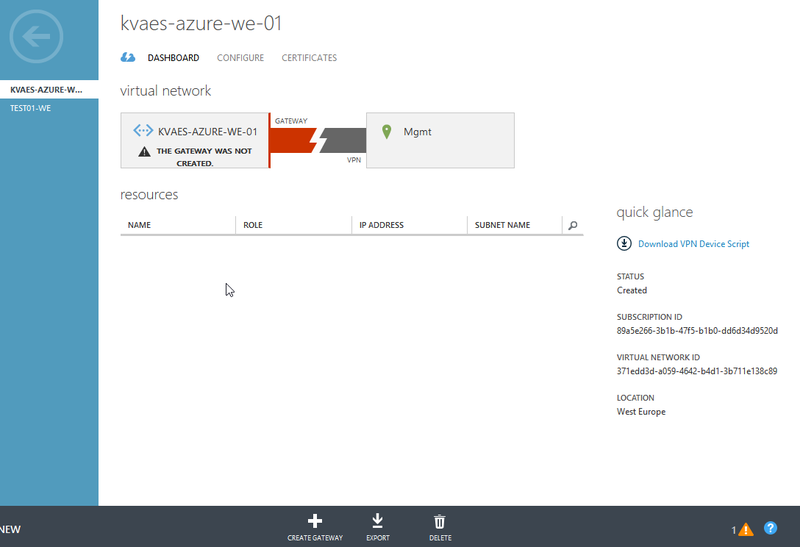 The term local is seen from “your perspective”, being the network outside of Azure. Here we’ll enter the external IP address of your own router as the “VPN Device IP Address” and the “address space” will contain the subnets you have on your own internal network. 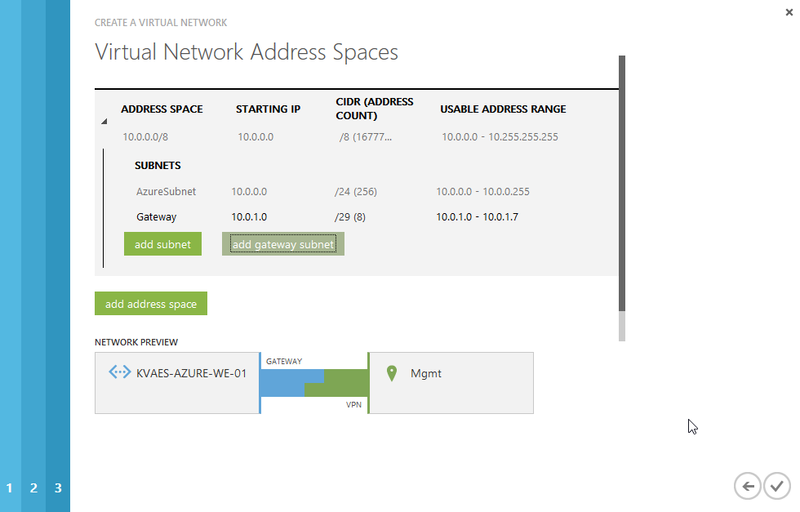 Next we’ll be setting up the “Address Space” that will be used in Azure. We’ll also obliged to enter a gateway. Press the “V” to acknowledge your settings, and the virtual network will be created (which may take a while). Browse to “Networks” to see our newly created network and click on it. Click on the “Create Gateway” link at the bottom. 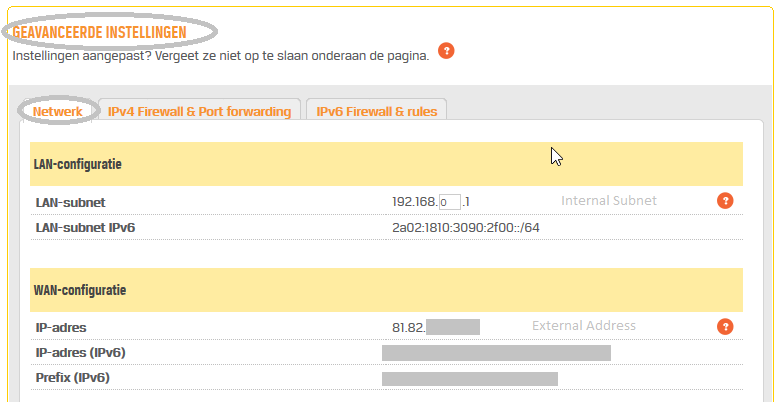 Now that the gateway has been created, the “gateway ip address” is shown ; 104.46.54.52. Note this down, as we’ll be needing it later on… Next up is to press the “Manage Key” link down below, so we can see the “private key”. We’ll be needing this to in order to bring up the tunnel. 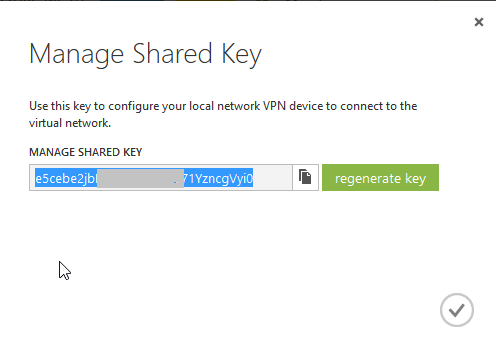 Here you can “regenerate” a new key or/and copy the key as you’ll need it for the tunnel configuration. 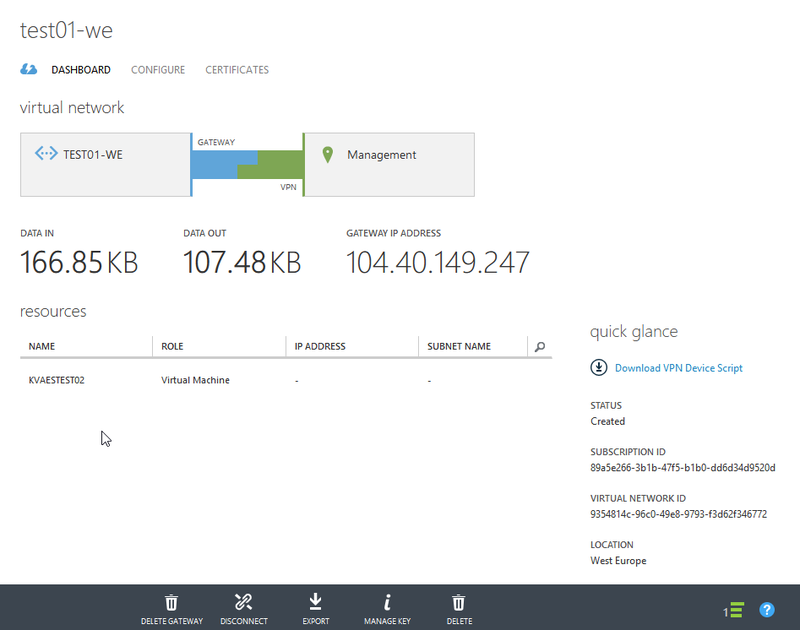 The “left”-side is your internal network and the “right”-side it the Azure side. 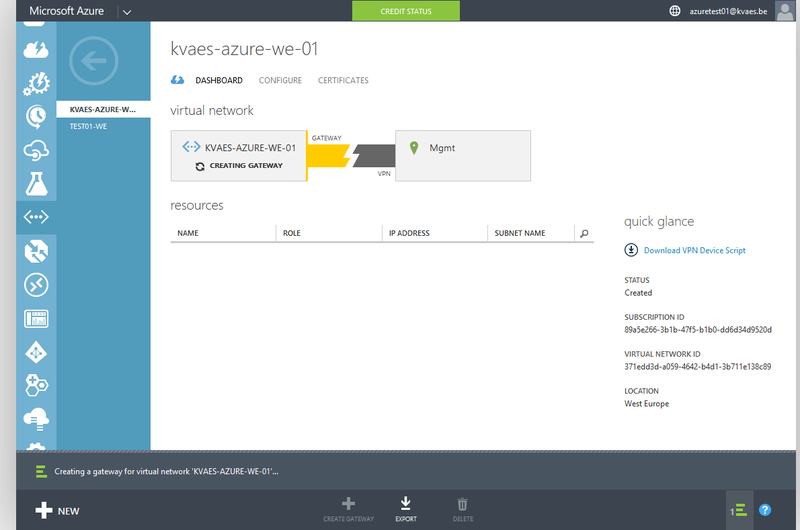 As the “right”, write the ip address of your Azure VPN Gateway. As the “left”-side”, write the ip address of the device running Openswan. The first ip is your “left”, the second your “right, and between quotes you enter your private key. 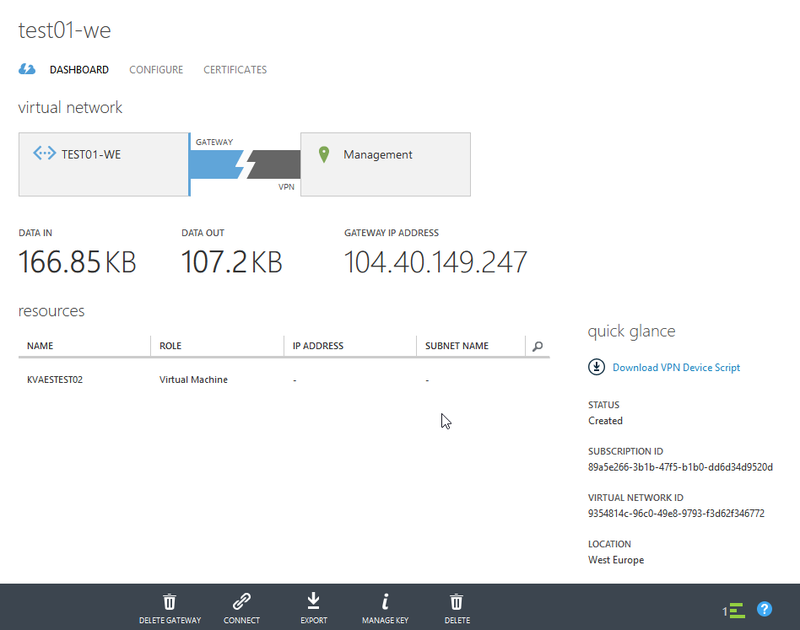 Browse to the admin page of your router. 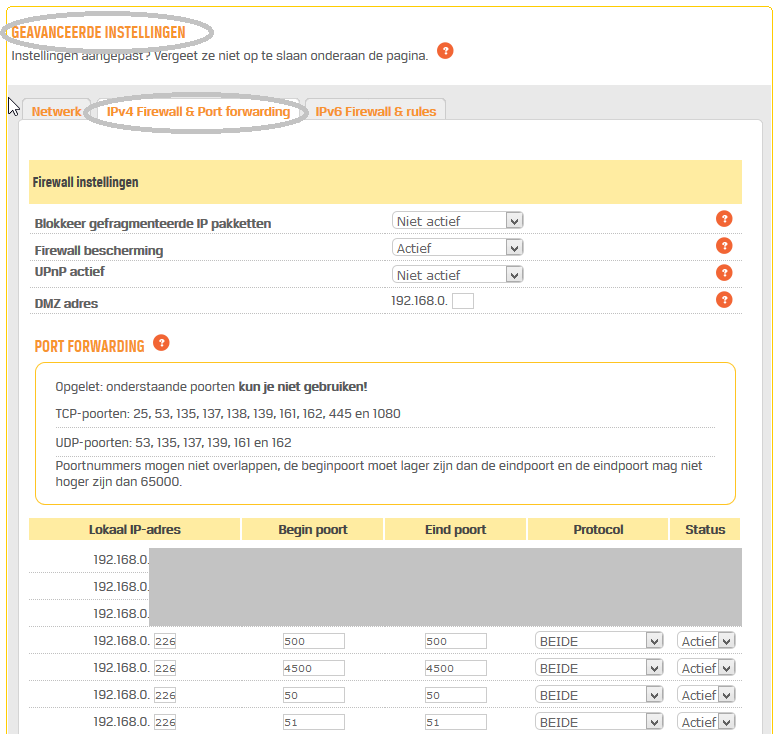 For T, this will be : https://mijn.telenet.be/ and navigate to the advanced settings. On the “network” tab, you can review your internal lan subnet and also the external address (“81.82.83.84”, as a reference). Port 500 : For both inbound and outbound filters. Should be set to allow ISAKMP traffic to be forwarded. Port 4500 : ESP packet will be encapsulated inside a UDP/4500 packet. Port 50 : For both inbound and outbound filters. Should be set to allow Encapsulating Security Protocol (ESP) traffic to be forwarded. Port 51 : For both inbound and outbound filters. Should be set to allow Authentication Header (AH) traffic to be forwarded. Direct the NAT rules to the system that will host Openswan (in this example; 192.168.0.226). 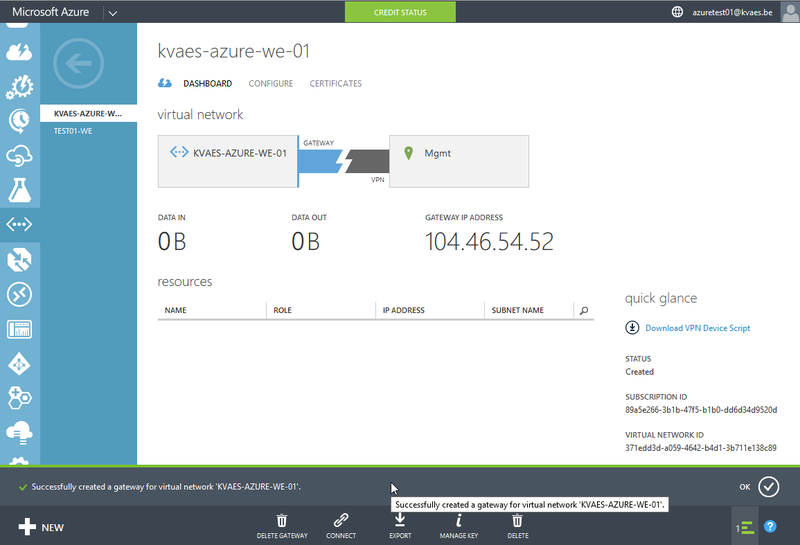 Now configure the NAT rules, and when you are done… press “Save”. Now you are good to go in terms of the firewall NAT rules. Browse to your virtual network … You will see that the connection is not connected. Press the “Connect”-button below… The link will show “Connecting”. After a while (feel free to take another break) the connection will become “Connected” as shown in via the visualization and as the “Connect”-button became the “Disconnect”-button. PING 10.0.0.0 (10.0.0.0) 56(84) bytes of data. And again, we’ll wait for it to pop online. The machine has ip address “10.0.0.4”, so let’s see if we can reach it. PING 192.168.0.226 (192.168.0.226) 56(84) bytes of data. What was the cost of this labo test? So the total ran up to a staggering 0,55€! Previous Post Database variants explained : SQL or NoSQL? Is that really the question?